A couple weeks ago, while I was wandering about in the Mennonite Twittersphere, I came across a tweet that I didn’t understand. Not that I restrict myself to friends and family in my Twitter interactions. Within the Mennonite corner of Twitter are people from all across North America who identify and comment on being or having been Mennonite. And a couple Mennotweeps from other parts of the world. I expect there are more out there but I haven’t found them yet. This is not for want of looking. Without being evangelical about it, I am always on the lookout for hitherto-unknown-to-me Mennotweeps both to expand my networks and in the desperate hope that one or two of them might post something amusing. And, yes, that happens just often enough to keep my trying. Typing “Mennonite” in the Twitter search box doesn’t yield up a lot that’s amusing. It typically brings up a lot of tweets from various Menno institutional accounts. The news magazines tweet out their headlines with clickbait on such topics as progress on the project to revise the hymnal, various subgroups considering name changes and, my favorite – the guy who introduced the Mennonite Brethren to e-commerce (for anyone who doesn’t know, no – the Mennonite Brethren are not a conservative, anti-technology branch of the faith). Other Mennonite institutional accounts include college and high school accounts who tweet out their volleyball scores, and the Mennonite thrift shops who tweet out their specials. Not a lot of amusing material in the institutional accounts, unless you imagine that all of the accounts are actually satirizing themselves. Which, quite frankly, they could be. The accounts that represent individuals with some connection to the Mennoworlds aren’t always amusing either. Some are all about the food. These are mostly people sharing pictures of vereneky and/or whoopie pies. 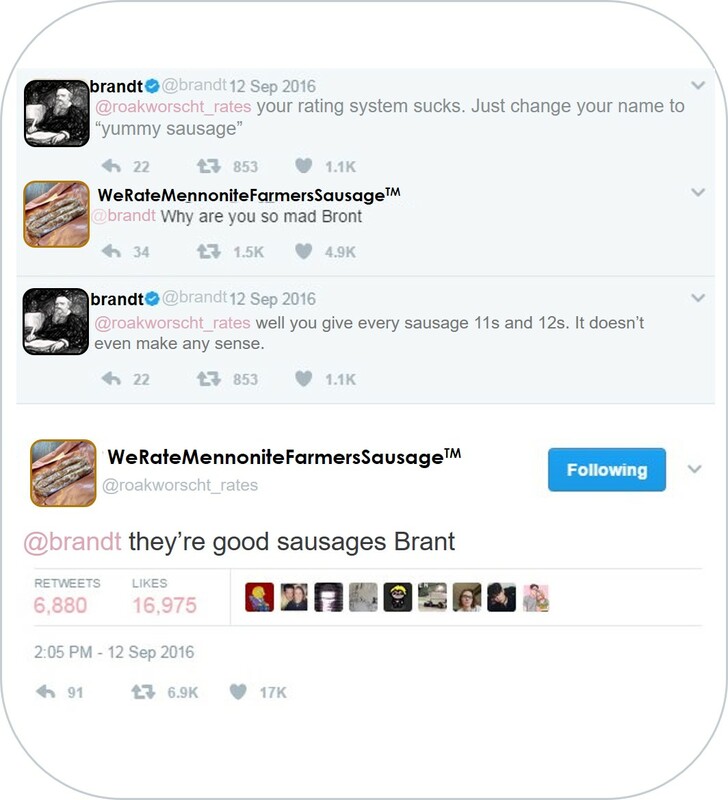 I am waiting for someone to come up with a “We Rate Mennonite Farmers’ Sausage” twitter account. Now, that would draw the Mennonites to Twitter. Or at least those with a connection to western Canada. And drive everyone else away. Many of the tweets from the Mennosphere are religious – inspirational posters in Twitter form, mini-sermons and tweets that link to longer sermons. There are a lot of those. And they vary in their theological slant, providing a little microcosm of our theological variation. Though, to be honest, I rarely click through to the sermonettes behind the tweets. I’m looking for the jokes. A lot of those come from the Mennonite joke accounts – because if you don’t label it a joke, we’re not likely to get it. But once in a blue moon one of the tweeps who normally only posts about food or theology comes up with a zinger. And that makes it all worth the search and the wait. Of course, searching Mennonite on Twitter also brings up a number of tweets from tweeps in the regular Twittersphere who pop by every now and then, mostly to display their ignorance about Mennonites in all our variations. These are also pretty predictable. There are the teenaged girls bemoaning the outfit or haircut that makes them “look Mennonite.” There are people expressing astonishment at seeing Mennonites with cell phones or sneakers. Some are convinced that the “Mennonites” they see in public are staring at them and judging. Sometimes people declare they will “become Mennonite” when they have grown frustrated with some aspect of the modern world. I have seen others but they were all plain to understand. As plain as a cape dress. The podcast Reply All has a recurring segment called “Yes, Yes, No” in which they explain confusing tweets. It is called “Yes, Yes, No” because typically the two hosts of the show know the context of the tweet and the executive producer does not. And they spend 15-20 minutes explaining all the back story behind the layered meanings of the various baffling tweets that come across the executive producer’s twitterfeed. In my house, when I passed the above tweet about the dinner table, we did not have “Yes, Yes, No” representing our understanding of the tweet; we had “No, No, No.” This despite there being two tech-savvy millenials in the household. And so, with the help of not one but two search engines, I embarked on a serious program of research in an attempt to deconstruct the tweet and make its humour plain to all my readers, whether they be Mennonite or just Menno-curious. And here it is. In way more than 140 characters. To most of us, “cat no banana” is nothing but three unrelated words strung together. But if 16 people have thought it the best combination of words for their twitter handle, it clearly has some kind of internet meaning. And it does! As the youtube addicts out there among my readers might already know, in early May, a video ostensibly by Cat No Banana called “He Not Like the Banana” appeared on youtube and attracted a certain number of fans who found hilarious the 15 second video about an angry cat that does not like bananas. Presumably our tweeter is one of these. This tells us that the person sending out the tweet about the Mennonite families who walk past their workplace is very trendy in their internet usage and has a bit of a wacky sense of humour. Also – good news. So far nothing has set off any red flags to suggest that this tweet will be masking either hatefulness or bonnet fetishes. We can proceed with caution. When I began this quest, I imagined that finding the origin of the tweet – finding the “slothful jeremiah post” – would mark the end of this story and leave me with the satisfaction of a job well-done and a mystery resolved. I did track down the referenced “slothful jeremiah post.” But the story doesn’t end there. The reference, I believe, begins on Tumblr. Tumblr – for those who don’t know – is a microblogging site somewhere in between Twitter and regular blogs like this one. There’s a lot of fan art there, and a lot of wacky humour. It’s where the kids hang out. It is possible that our tweet came from a young’un. Which doesn’t mean anything at all if you spend 0% of your time on message boards. Or if the only message boards that you go to are the Mennonite ones. (Yes, there are Mennonite message boards – even Conservative Mennonite ones. But I haven’t seen any shitposting there). According to a number of reputable internet sources, a “shitpost” is a post on an internet message board that sets out to derail a conversation for fun. While trolling and flaming are always offensive, shitposting may or may not be offensive. It might be considered “yanking the chain” of the people earnestly involved in the conversation thread. For example, I could imagine a thread on a Mennonite message board where some earnest Mennos on the web are busy discussing the markers of authenticity in a quilt and someone jumps in and starts shitposting by randomly beginning a conversation about pie. Or maybe there’s a discussion on whether Mennonites who give up on the peace position can still call themselves Mennonite and then someone jumps in and starts insisting that Mennonites and Meninists are the same thing. A shitposting game apparently asks people to out-shitpost each other by being increasingly irrelevent to anything. In the Tumblr joke, the shitposting game has “Father Amos” starting off a message with an earnest exhortation to hard agricultural labour and good works. That is followed by “Slothful Jeremiah” shitposting with an image of Shaq sleeping. Part of the joke might be that this is not a particularly great example of shitposting. It’s not really offensive and it doesn’t derail the conversation so much as it just seems to be a bit of sass in response to the “rise and shine” message. It’s kinda cute. It also doesn’t go on beyond the two posts. It’s like in the whole community, only one person would join the game and that person would do so in a fairly mild manner. Turns out that the sleeping Shaq image is a thing. For one thing, Shaq himself is a big deal on the internet. A lot of my Mennonite readership will recognize the name Shaquille O’Neil and might even remember that he was once a famous basketball player. That doesn’t mean that we’d recognize him in a random tweet ostensibly about the Amish work ethic. But people steeped in the world of internet memes will recognize him anywhere. Though Shaq has been an internet darling for a long time, my “research” shows that sleeping shaq memes had their hay day in March and April of this year. The Tumblr post, appearing at the end of April, came pretty much at the end of the wave. A little piece of the humour in the post, then, is that our imaginary Amish shitposter used a meme well after it had peaked. Mennos and Amish – always a bit behind the times. But the bigger issue is that Slothful Jeremiah got it wrong. An actual Mennonite version of this meme might, for instance, have Shaq sleeping through a congregation singing hymn #606 and waking up to news of a sale at the local thrift shop. Or something. The intended audience for the Slothful Jeremiah post were already familiar with how a sleeping shaq meme should look. That Slothful Jeremiah posted only one panel with the face of a sleeping Shaq is definitely a big part of the humour. On one level, it’s just poking fun at the Amish for being out of touch and not understanding meme culture. But I think it may be cleverer than that. I think they may have been suggesting a “plain” version of the meme. Partly this is just by leaving out three panel to make the meme simple in style. And partly it’s by leaving out the electrified look of the “deep-fried” style of the second half of the sleeping Shaq meme. Maybe the Amish wouldn’t do filters on their photos, perhaps because they would be seen as worldly or that they have a level of dissimulation contrary to the spirit of the Schleitheim Confession. Or just because they would need electricity for the photo filtering. I suspect that our mysterious tweeter would not have enjoyed the post so much, however, were it not for the name, Slothful Jeremiah. Both Twitter and Tumblr users love to come up with clever names (see above, item #1). The name Father Amos looks like a straightforward name – Amos is one of those common Amish names – and adding “Father” to the name is an appropriately mild addition to what we could imagine to be the real name of the imaginary Amish Tumblr user. But Slothful Jeremiah is an imagined internet name that is just slightly subversive. We all know, of course, that Jeremiah was an Old Testament prophet known for lamenting outside the walls of Jerusalem. I don’t know if he’s a particular favorite among the Amish or Mennonites; I think a lot of my people are partial to Isaiah. But we know about Jeremiah because we know about Rembrandt, having claimed the painter as our own. The Rembrandt painting shows Jeremiah as an old man sitting and looking down in despair. He could be understood as slothful, though that’s not the usual interpretation. He’s a prophet known for lamentation. Lament and sloth are not the same thing. It is possible that an Old Testament scholar can provide a detailed exegesis on Jeremiah and sloth that will make sense of this but I suspect that I may have been overthinking this as I scoured the online Old Testament for relevant lamentations. Instead, I think that the corner of the internet that loves this meme just loves the name because it sounds old-fashioned in ways that they imagine the Amish to be old-fashioned. And it goes well with the word “slothful.” Jeremiah isn’t actually a name that is common among the Amish, though it is featured on the US reality TV show Breaking Amish (I haven’t watched it, but I don’t think that the character in the meme is the same as the character in the show. From what I’ve read about it, it doesn’t seem to fit). But it doesn’t matter if it’s not a typical Amish name; it’s supposed to be a fake name. And “slothful’s” just a great word. It’s bad without being all that bad. And it’s also a sort of old-fashioned sounding word. Again – kinda cute. I now think we have all the information we need to understand that original tweet. The person who wrote this tweet is probably young and definitely participates in Tumblr and internet meme culture. From the tweet itself we know that Cat No Banana lives and works someplace where there are a lot of Mennonites wandering about. These are pretty definitely plain-dressing Mennonites because when they walk by Cat No Banana’s workplace, they remind Cat No Banana of a Tumblr post that imagined an Amish message board where someone with the amusing name “slothful jeremiah” did a plain version of some of the silliness that sometimes happens on the internet. The person tweeting found the post so funny that it was taking over their life; i.e. “ruining” them. It’s not really about Mennonites. It’s not even really about the Amish. It’s about an imagined world where plain-dressing Anabaptists are quaint, simple, old-fashioned and online. Or so I think, anyway. I might have got it horribly wrong. Sometimes the internet’s a very strange place. Today’s cocktail is a slight variation on the classic Mint Julep. If you happen to have found a silver tumbler at a Thrift Shop, you can serve this in the traditional manner (I’ve been watching Twitter for announcements of cocktail supply sales at Mennonite Thrift stores, so I’ll let you know if any come up). If not, just serve it in a short glass. Mix the syrups with the bourbon in the bottom of your glass. Add half of the crushed ice and stir. Top with more crushed ice until the glass is domed with it. Garnish with mint sprigs and serve with a straw. *A kind stranger on Twitter has suggested that I have “shitposting” wrong at least how it plays out on Tumblr. There, apparently, shitposting is more about ubsurdity than about derailing a conversation. So, my examples of quilts and pies is all wrong and a better example would be a discussion of a quilt monster that was bent on taking over the world. You are probably my cousin too. Back on track, this has probably the longest drunk menno post ever, and I will take that julep now. I want to thank you for mennosplaining twitter and the shitposting game and the sleeping shaq meme to me. Truly it is the best explanation of twitter I have seen, since I am not a twit…err…tweep yet. I know I run the risk of appearing humourless, but of course I didn’t introduce the MBs to e-commerce. The actual story of the bookselling project is that I convinced the Mennonite Historical Society of Canada to let me make one last attempt to sell the books, which the society had, I think, mostly given up on. The strategy was to discount the books massively and to market them primarily through social media – nothing innovative about this, I admit, except in that the society hadn’t ever considered a social media campaign, which evidently reached a lot of people – far more, I expect, than the printed brochure I found from a previous effort. Obviously the liquidation pricing was the other factor in the effectiveness of the project. I loved the “Yes, Yes, No” – though I’m surprised you didn’t raise the possibility of a possible Mennonite connection with the co-host PJ Vogt. Thanks Jeremy. Even with your explanation, it remains one of my favorite non-news stories of the year in the Mennonite press. I can appreciate that. The “here’s what he did” attempt to make the story clickbait was definitely funny.